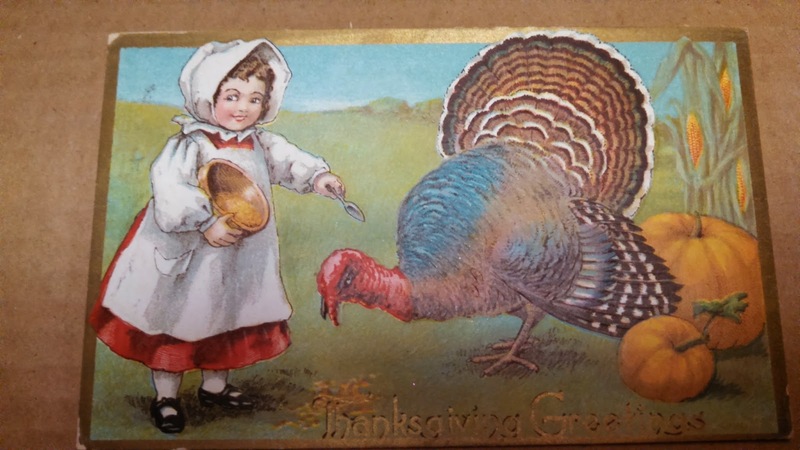 Here at the Clarke, we have two manuscripts (primary sources) that mention Thanksgiving along with some nostalgic Thanksgiving postcards and greeting cards. "The 29th of November  we observed Thanksgiving Day as ordered in the President’s proclamation. * It’s wintry and yesterday it snowed hard all day. Maria [a daughter] is home and so four of them went to church while my husband and I stayed home. The roads aren’t fit for buggy or sleight[sic] so they walked to church. We talked and read together and felt a profound sense of gratitude for all we had enjoyed throughout the past year. When the children came home they said that Rev. Pieters had preached from Psalm 29: ‘But in His temple He is honored by everyone.' We had a fine meal at noon and gave of our substance for the needs of the students and the poor. And so another Thanksgiving day was history." The Clarke has two folders of material on Geesje: a poor quality photocopy of her diary in Dutch, and a much more legible, later, typed transcription of it. The diary is also available on microfilm. 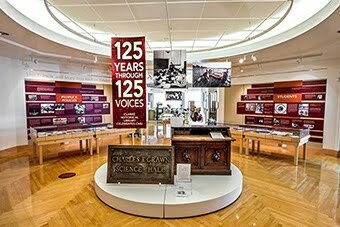 The original diary is housed at the Joint Archives of Holland, Michigan. Geesje’s diary discusses family, faith, Holland’s history, crops, the weather, and local events from a Dutch immigrant's faithful perspective. Born on August 5, 1820 in Nastenbroek, the Netherlands, Geesje married Mr. Visscher on May 2, 1841. They were both from Separatist families. In 1845, the Visschers sailed for the U.S. with Rev. Van Raalte, eventually settling in Holland, Michigan by 1846. Together, the Visschers had nine children: a daughter who died after seven weeks in 1843; Lemmie (a daughter) (1844-???? ); Willem (William) (1845?-1872), who served in the the 16th Michigan Infantry Company D during the Civil War as a substitute; Arend (1849-???? ); Jan (1852-???? ); Maria (1855-1856); Johannes (1856-???? ); Maria (1858-???? ); and Gezina "Selena" (1863-????). All of the children became teachers, ministers, and/or married ministers. Lemmie, a teacher, and her minister husband were missionaries to Africa twice, the second time during the end of the Boer War. Jan was a minister in the Dakotas. Arend became a lawyer. Willem studied to become a minister and then studied medicine in NY (State). He died there of smallpox there in 1872. 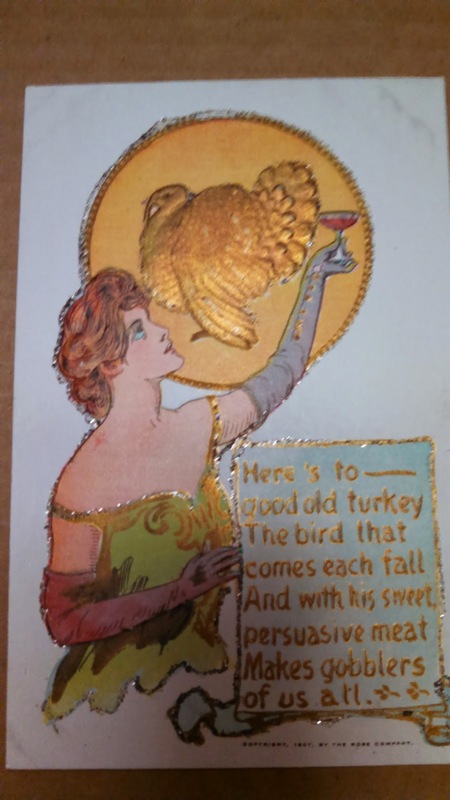 Our second item comes in the form of a a Thanksgiving table place card with "Mother" written on a turkey in the Ursula Hemingway Jepson scrapbook, 1903, 1951. 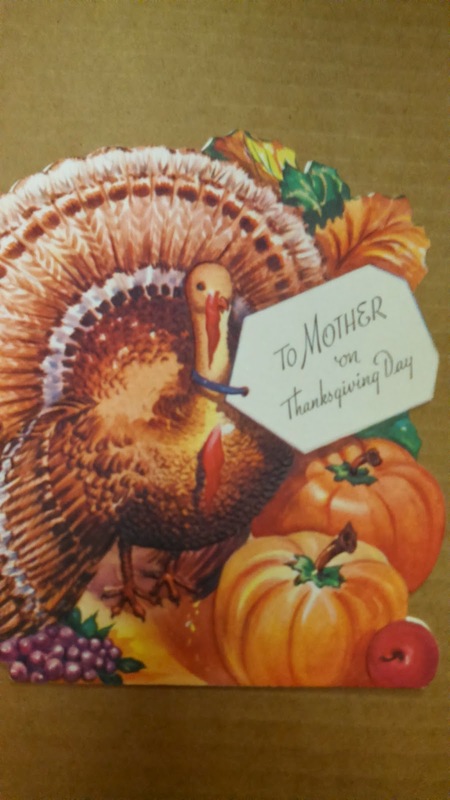 It looks very much like this greeting card turkey sans vegetables and leaves. For more information about these collections, contact Marian the Archivist at marian.matyn@cmich.edu. 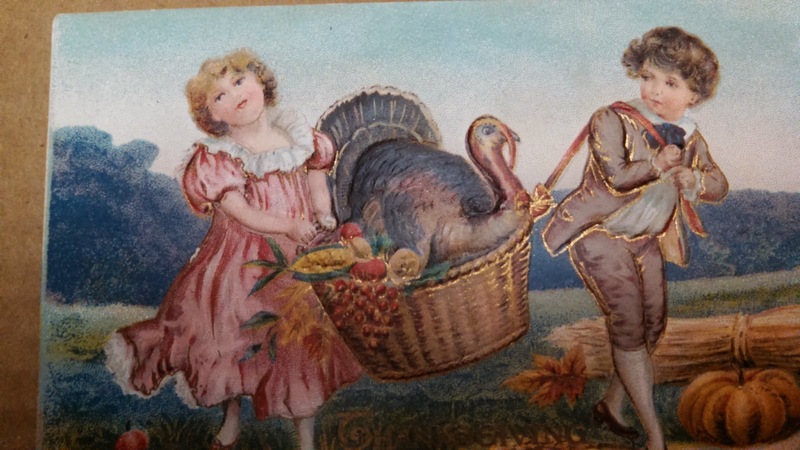 Wishing you and yours a happy Thanksgiving holiday.